Graphic 45 LOVE NOTES 12 x 12 Collection Pack 4501826 at Simon Says STAMP! 4501826 This item is on reserve until If you would like to reserve this item now, you may purchase it now with the rest of your order. We will hold your order now and ship your entire order as soon as this item is back into stock. If you would like your order to ship now, please place this item on a separate order. Success, Graphic 45 LOVE NOTES 12 x 12 Collection Pack 4501826 has been shared! 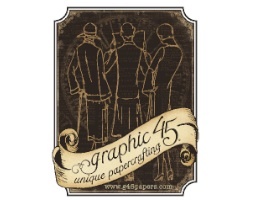 Graphic 45 is an award-winning scrapbook and paper crafting company owned and operated by a mother and her two daughters. Diane Schultz, the Designer, the CEO, and creator of Graphic 45 is passionate about being creative and eager to make it possible for others to find their creative voice. Diane's background includes stints as a designer for McCalls, Simplicity, Vogue/ Butterick, Mattel Toy Company and a host of other jobs that each, in some way, led her to what she does now. Graphic 45 strives to make products that inspire your next card, memory album, scrapbook layout, DIY party decorations or home decor project.